The bedroom is one of the most important rooms in any home. It’s where you relax after a long day looking after the kids, where you spend intimate time with your loved one, and where you recuperate and prepare yourself for the day ahead. Unfortunately, after a while, it’s easy for any bedroom to become cluttered, outdated, and unappealing. 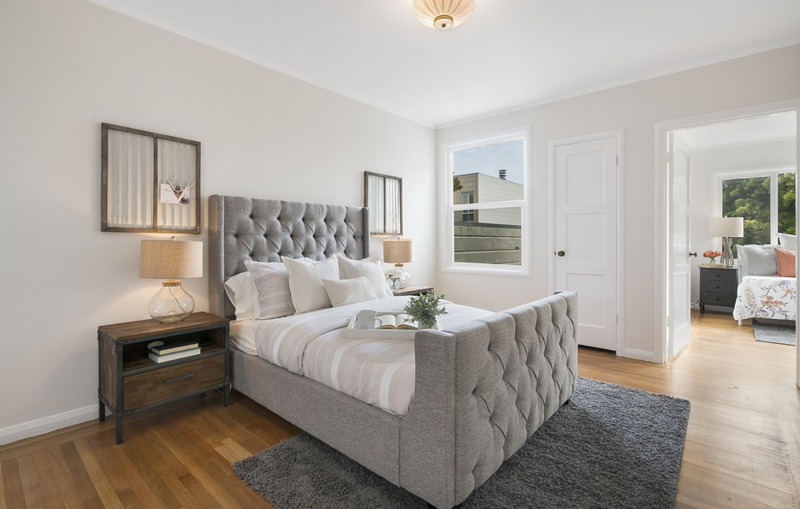 If your bedroom isn’t the Instagram-worthy room you’ve been hoping for, now could be the perfect time to invest in a quick, simple, and cost-effective makeover. After all, changing the atmosphere of your bedroom doesn’t have to be a time-consuming or expensive process. In fact, you can even source a top-of-the-line mattress online. A little rearranging, a good colour scheme, and even the right window dressings can make a world of difference. Sometimes all you need to do to transform your bedroom from drab to fab, is to give yourself a different perspective. Look at where you currently have your drawers, wardrobes and bed, and think about whether they might work better at a different angle, or in a new configuration. 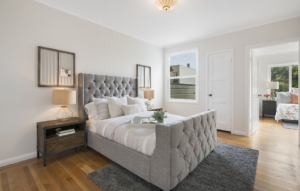 You may be surprised at how easy it is to add charm to your sleeping space when you move the king-size bed into the middle of the room, rather than against the wall. If you’re not sure how to rearrange things, try sketching out an idea of what your ideal bedroom might look like first. It’s worth keeping some cleaning tools on hand too – there’s likely to be some dust to clean up when you’re finished moving things. With your bedroom’s new layout showing off your furniture in all its glory, it’s time to think about how you can let light into the room. Window dressings can be complicated in a bedroom, as you want the perfect combination of something that keeps out the sunlight when you’re sleeping but lets plenty of rays in during the day. Switching to shutters could be a great way to give yourself the best of both worlds in your bedroom. DIYshutters.co.uk has plenty of options that effectively block out light for when you’re snoozing, and also give you an extra level of privacy when you need it most. Colour is a vital consideration when you’re giving your bedroom a makeover. You’ll want something that demonstrates your unique personality but remember that going too bold with your shades could mean that you end up giving yourself a headache during those hours when you’re supposed to be getting plenty of rest. While there’s nothing wrong with having a passionate statement wall, it’s usually a good idea to keep most of your colours calm and neutral. Remember, if you stick to soft shades and you want to add more chic style to the mix, you can always spruce things up with some colourful accessories, bedding, and throw pillows. The bed is the central and most important piece of furniture in your bedroom, so make sure it shines. When we renovated our rooms recently, we went for king size beds. I just like that bit of extra space nothing of course to do with our pint sized nocturnal visitors! The thing about buying the bigger can mean that they can be that little bit more expensive but on thing I resolved a a long time again was never to scrimp on bed linen. I sound like im being totally self indulgent but there is something so nice after a tough day in work to sink into fresh comfy sheets. When you’re changing the look of your room probably one of the most visually effective together with cost effective ways to freshen up your room is new duvet covers. Where you go for a total colour revamp, patterns or bling. You can really use these to add texture and dept to your room. In fact you could vary the shades for the seasons or times of year. Its much lower cost and lower maintenance than paint or wallpaper. I saw some really stunning Catherine Lansfield patterns duvets which would really add a lovely depth to a room renovation. Get your hands on king size quilt size quilt covers from Yorkshire Linen. Honestly some of the best value I have seen for that size duvets. They also have some great kids duvets. The boys bunk beds are arriving in 2 weeks so we will have to have a nosey and let the boys pick what they would like. Many of the duvets have matching accessories available too which I actually really like. Finally, remember that the little things can go a long way when you’re creating your perfect bedroom. Attractive bedside lamps and a few photos of your friends and family can help to bring warmth and personality to your room. The finishing touches you add will depend on your specific preferences. For instance, some people will want to go with a family-friendly look that features plenty of pictures of loved ones, while others will be prefer a romantic atmosphere with scented candles and luxurious textures. If you’ve been dreaming of the perfect bedroom, now’s the perfect time to take the plunge. With the tips above, you’ll be able to create your perfect bedroom experience in no time, without leaving your bank account in tatters!